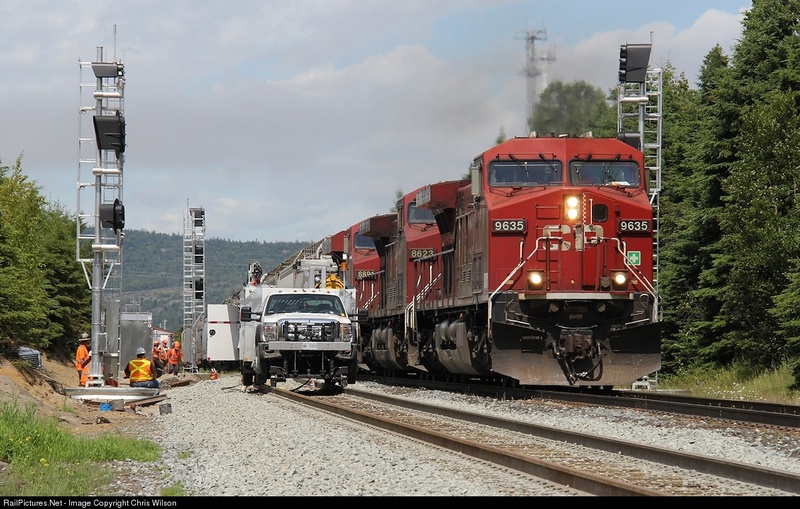 You might remember a few years ago where I posted about the strange mystery searchlights being installed by Canadian Pacific. They appeared to be recycled searchlight internals encased in a brand new housing. 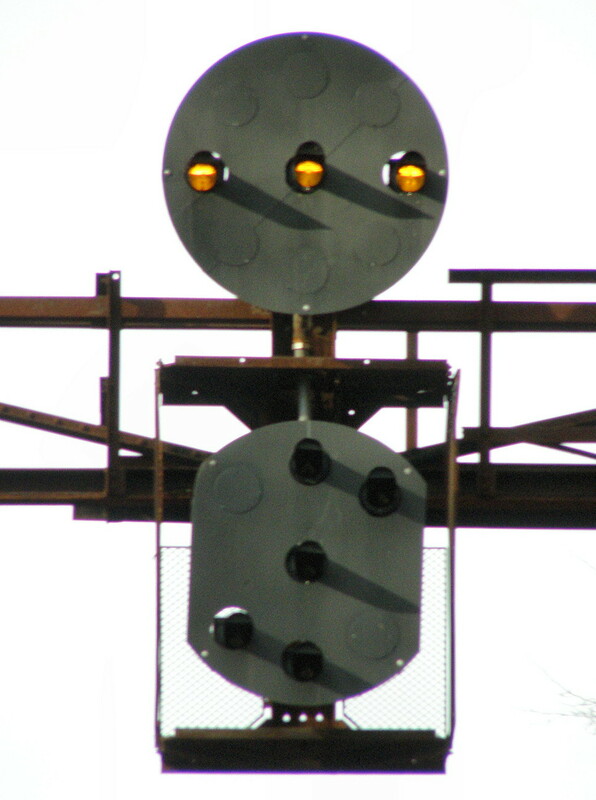 Regrettably CP has retreated from its searchlight policy, opting instead for more Safetran Darth Vader signals just like every other railroad in North America. Or at least that's what I thought until I saw this photo. The upper heads of those new Vader masts looks normal enough with the scallop shaped modular lamps, but the lower heads look...different. Could those be refurbished US&S N2 and N3 units? Sure looks appears that way. I'll have to keep an eye out for more evidence, but this isn't the first time old N heads have been used on new signaling. Out on the old DRG&W main a couple of the new automatic signals being put in by UP are employing the same tactic. More news from the land down below down under. 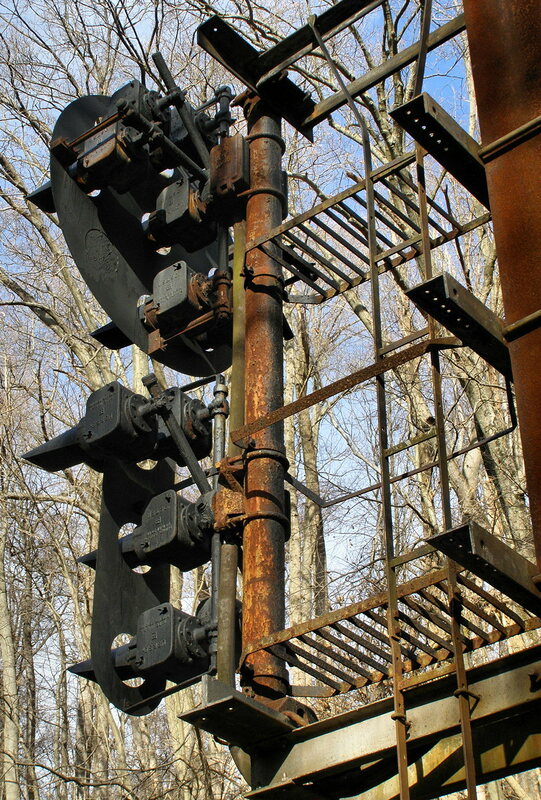 On August 1, 2015 the last manned signal box (aka interlocking tower) on the southern island of New Zealand closed. Addington signalbox is located in Christchurch, NZ and over the years it had come to control much of the Christchurch terminal area. 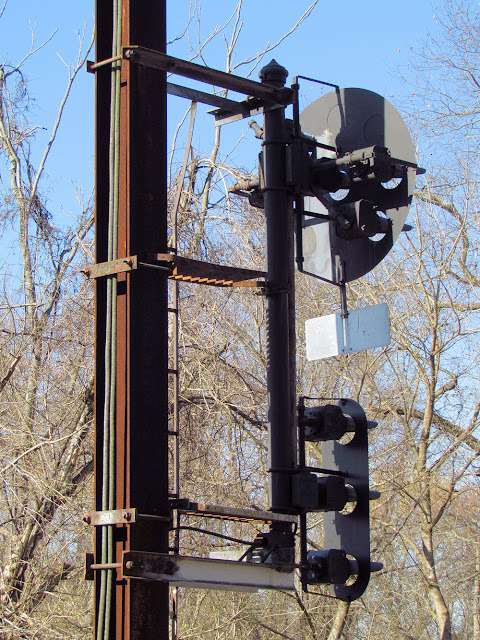 Centerpiece of the tower was a 1930's vintage McKenzie and Holland Style A electro-mechanical interlocking machine with the extended territory being controlled from unit lever CTC panels. 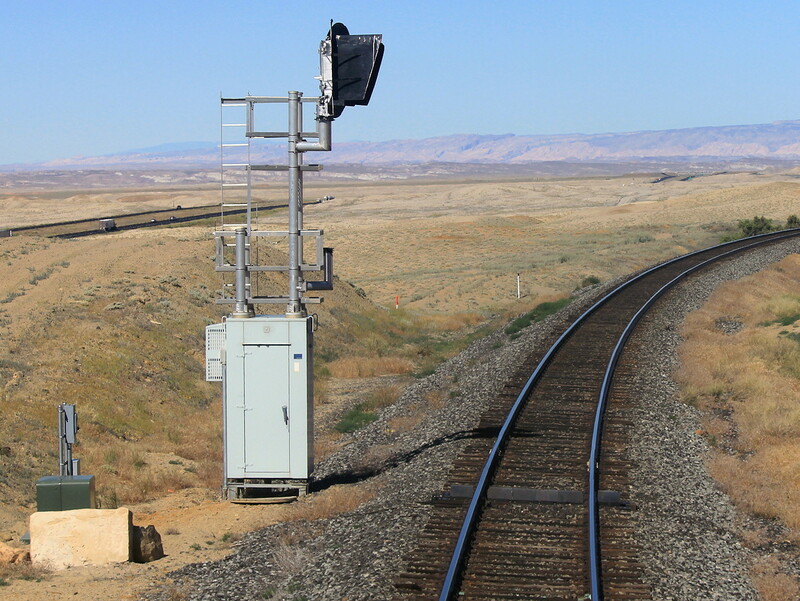 The tower is also responsible for gate operation at a number of nearby level crossings. Here is the diagram of the Addington area with the original territory located at the lower right. Since it was built Addington interlocking has changed dramatically leaving only a handful of active levers on the old interlocking machine. There is comprehensive gallery of interior photos located on Facebook, but for those of you without FB accounts you'll need to settle for this 2008 video posted on Youtube as I was unable to find any other photos. According to my count there are 11 active levers, 8 signal, 3 switch and 1 lock. The frame looks similar to GRS Model 5 just with miniature levers replacing the pistol grip slides. The model board covers the territory from Linwood through Middletown South including intervening interlockings at Middleton North and Christchurch. The New Zealand signaling methodology is more similar to North American practice than to UK practice with speed signaling, permissive signals, CTC and atomic interlockings. Unfortunately NZ is also like North America in its general abandonment of manned interlocking towers. Today all signaling on the south island is now remote controlled from Wellington on the North Island. Remaining north island towers like Petone are also closing at a steady clip. I urge anyone who may be traveling to New Zealand to check out some of its fading railway heritage in addition to its natural beauty. Sorry for the delay in getting the last few segments of Port Road Trips out. I figured since I was so closed to the end there was no real need to rush as I was still planning my next big project. 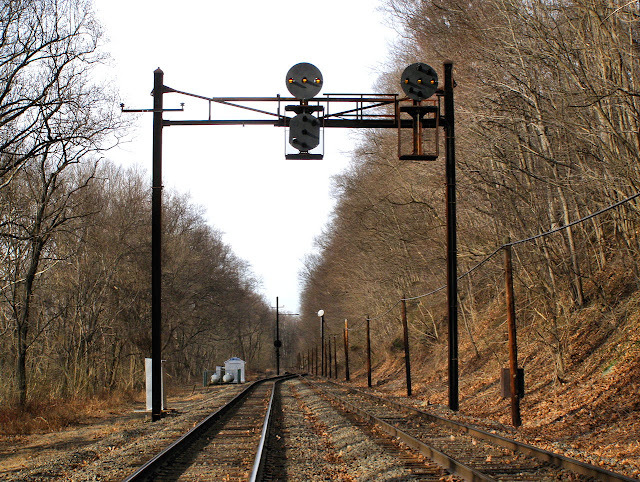 As one might have surmised from the general pattern of Port Road Trips, this week I will be covering another three signaling locations starting at CP-WEST ROCK, continuing on to the intermediate signals at MP 6.4 and finishing up with CP-TOME. To help you get oriented here is the 1997 Conrail interlocking chart for the area covered in today's post. CP-WEST ROCK marks the western end of the second of three original signaled sidings on the Port Road. 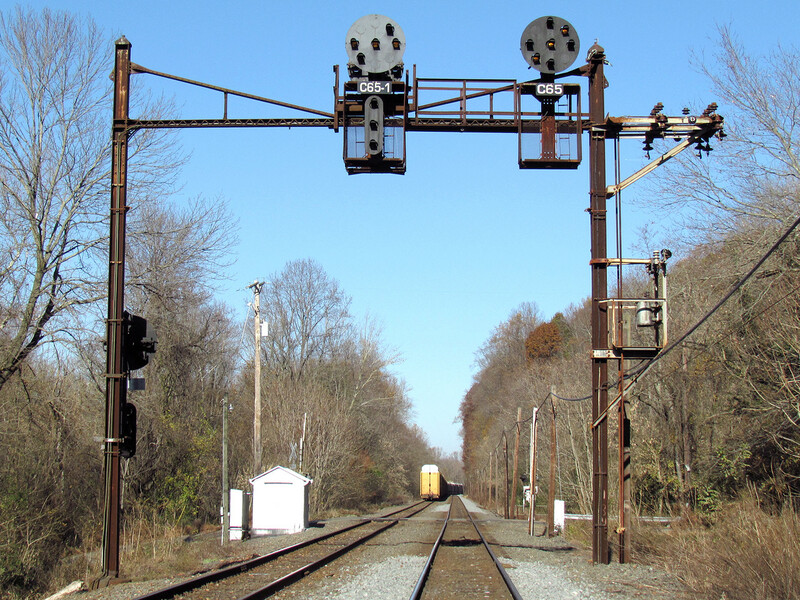 Like the Holtwood siding, this "siding" is more of a second main track as it has a two track intermediate signal smack in the middle of it. 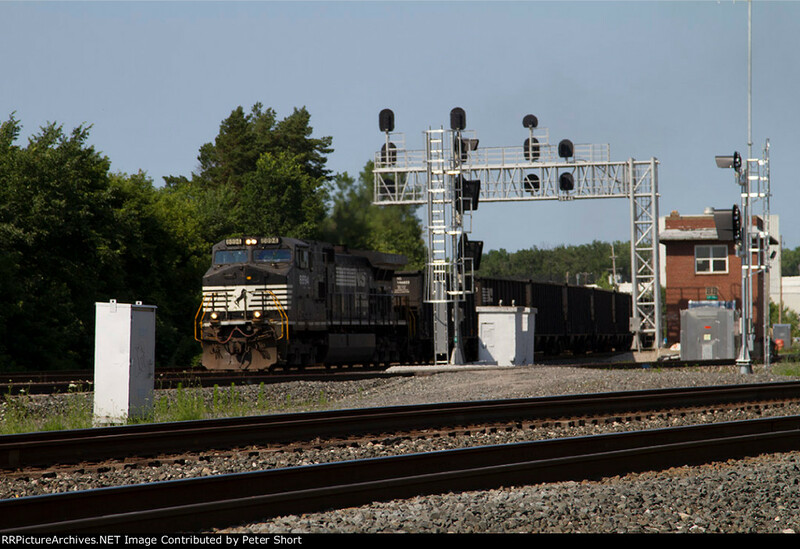 Located only 4 miles south of the Pilot siding, it is the preferred option for trains to pass in the overnight hours as traffic flows on and off Amtrak's Northeast Corridor. Like the other interlockings south of Holtwood, CP-WEST ROCK has been lightly rehabilitated by NS and features re-painted PRR equipment. 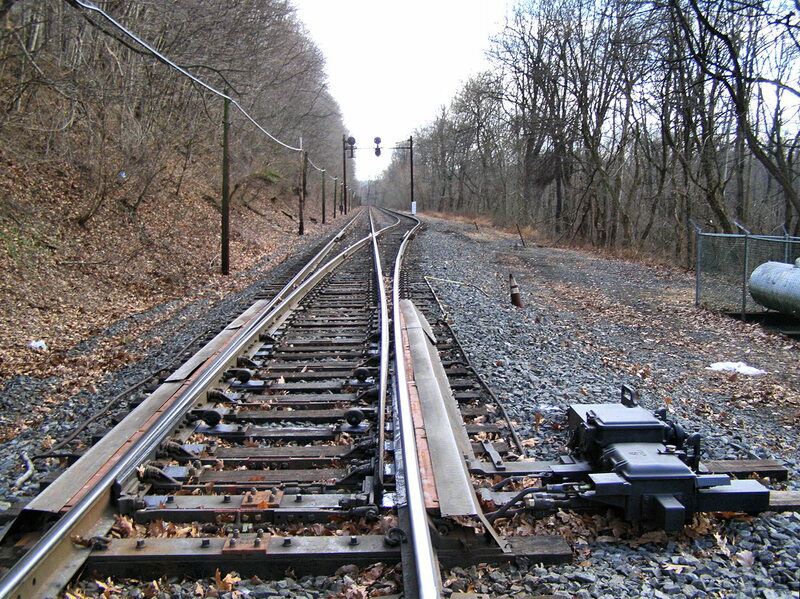 Like most of the other interlockings we have covered, CP-WEST ROCK is a simple "end of siding" affair with a single turnout (#217) and three signals. All designations are as they appeared on the CTC machine at COLA tower. The 218R signal is mounted on a surviving full height catenary support, instead of the chopped down poles seen at CP-WEST PILOT and CP-MIDWAY.. As this siding is fully signaled, the 218L is equipped with a lower head able to display Medium Clear and Medium Approach. Stop and Proceed takes the place of Restricting so no lower head \ position is provided. In this rear quarter view of 218 L one can see where the fresh new paint has and has not been applied. From the condition of the signal cable that does not appear to have been replaced. These photos were taken in 2011. 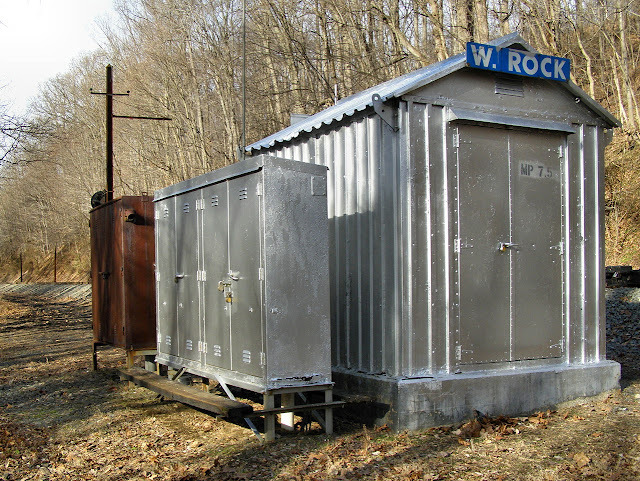 Like the MIDWAY and the PILOTs, the relay hut at CP-WEST ROCK is the original PRR equipment and spots a fresh coat of temperature reducing silver paint. Behind the hut is an auxiliary cabinet for relays and other equipment. The Conrail blue interlocking signs have also been retained. The official milepost of the interlocking, 7.5 from Perryville, is stenciled on the hut door. 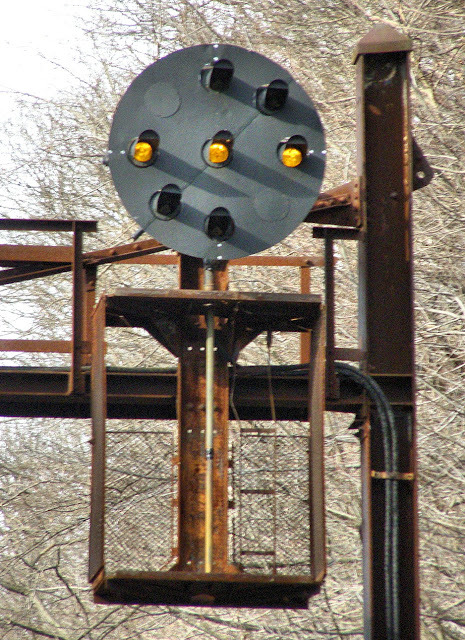 If you are wondering where the "pole line" satellite dish is, it is mounted across the tracks on an old catenary post. The Medium Speed #217 turnout is powered by a new USUS M23 point machine, installed as part of the refurbishment. Point heating is provided by a propane fired direct burner system as indicated by the telltale shrouds favored by Conrail. The 217 switch was left in the reverse position when I came upon it. Since CP-WEST ROCK is closer to civilization then many of the other interlockings, the propane supply had been surrounded by a barbed wire fence to deter theft. 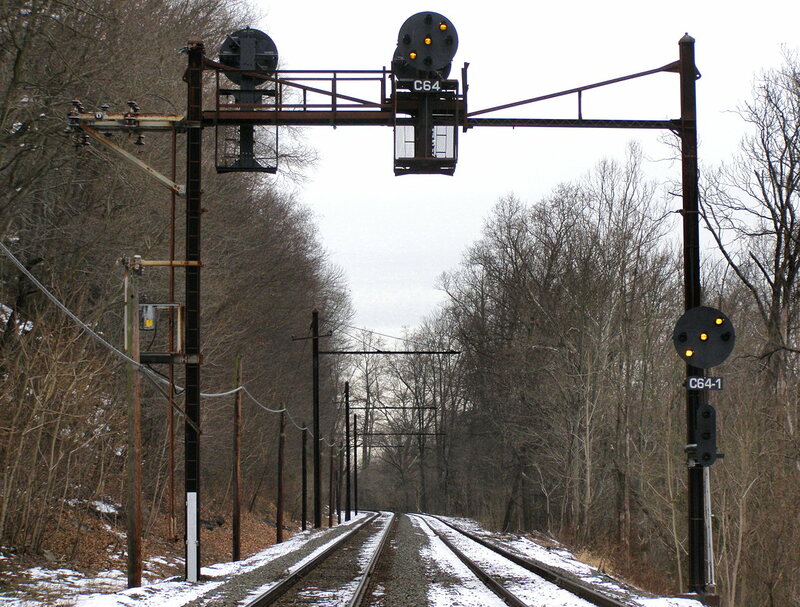 The westbound signals are mounted on a typical two-track catenary gantry modified to support signals. The signals were controlled by a single lever (218) on the old COLA machine with 218RA on the main track and 218RB on the siding. The 218RA is a single upper PRR PL head that has had the lower Stop and Proceed marker removed in the refurbishment. You can also see the fabric insulated signal cables that were not changed in the refurb. The shiny screws on the freshly painted face of the PL however, were replaced. 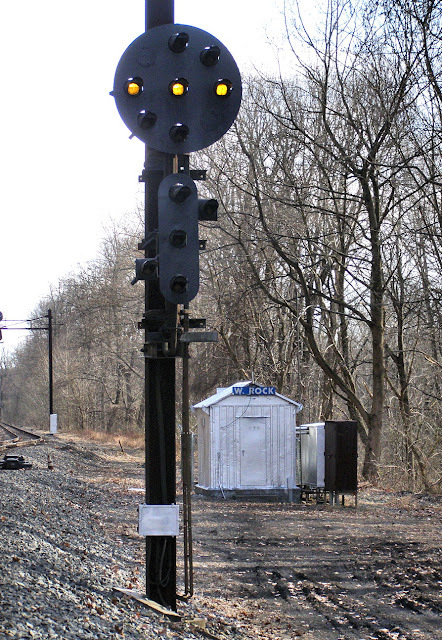 The 218LB signal is typical for what one sees when exiting siding tracks with a Stop only upper head and a lower head supporting Medium Clear and Medium Approach. The lamps are bright and well focused, a problem with US&S pattern PRR PLs, which use a complex lens and parabolic mirror system to focus the output from the low power bulbs. 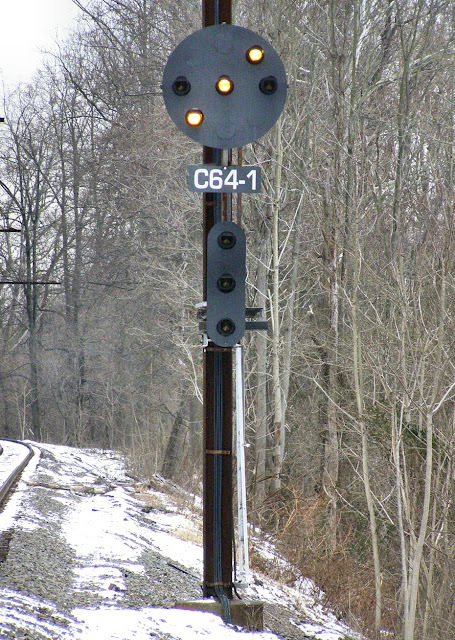 The intermediate signal between CP-WEST ROCK and CP-TOME is located around MP 6.5 with the eastbound signals bearing the plate C64 and the westbound signals C65. According to the interlocking chart this signal location is known as "Rock" (explaining why CP-WEST ROCK is CP-WEST ROCK), but I have no additional information about the history of the name. The signals are mounted on a modified catenary gantry with the eastbound siding signal mounted on a mast position to the right of its track. 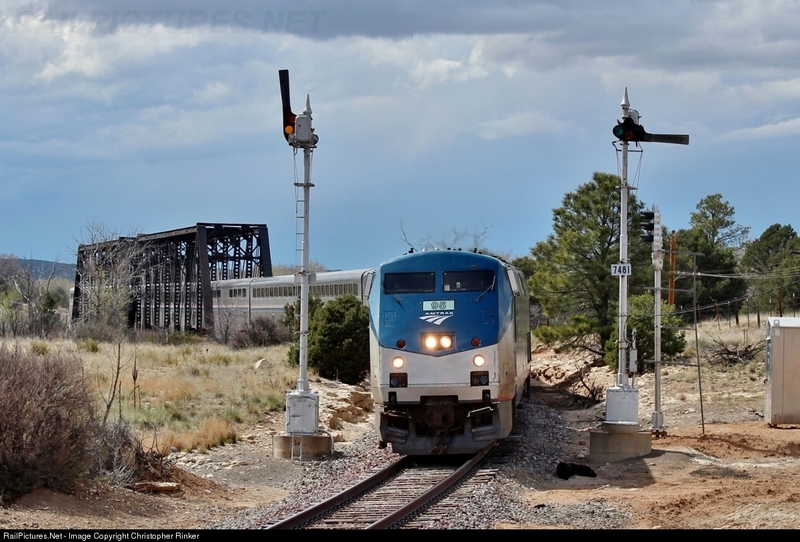 Here in this Feburary 2011 photo we see both C64 signals displaying an Approach indication for a Stop at CP-TOME. As the siding is only two blocks long the best indication available on the C64-1 signal governing eastbound traffic on the siding is Approach Medium. 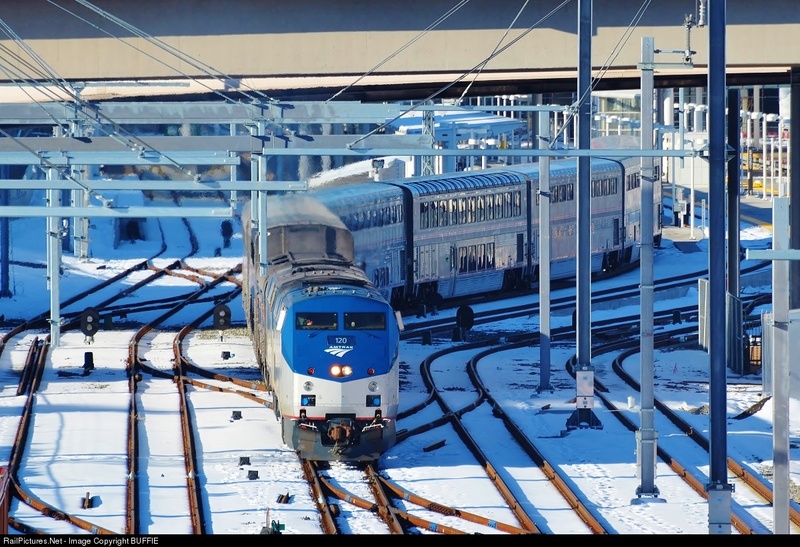 The "Rock" siding is popular for NS to store high and wide trains before they are admitted to the NEC due to a a length of track between here and CP-TOME with larger than normal track centers. Here in this 2012 view we can see that the refurbishment painting applied to the entire signal structure, unlike the job performed at CP-WEST ROCK. Without a diverging movement at CP-TOME the main track signal is a typical 3-aspect PRR PL head, shown here displaying Approach. The "cage" for a lower head is nevertheless provided, which implied that the electric territory mountings were prefabricated without regard to context. 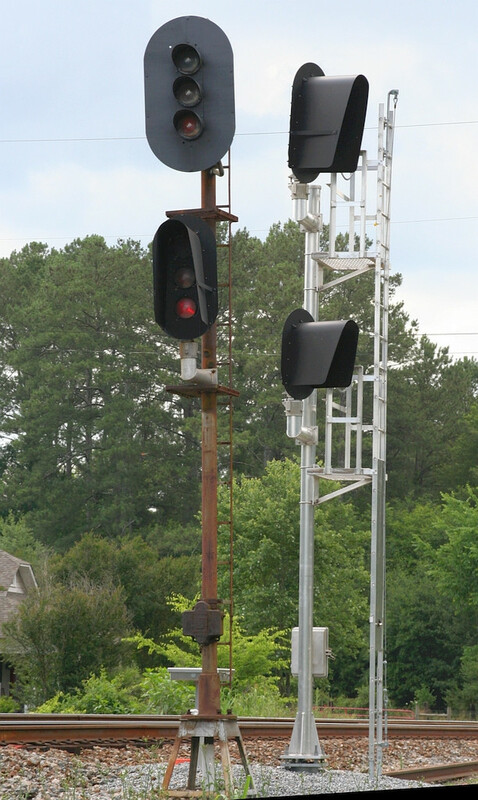 The westbound C65 signals located on the same structure and mirror the eastbound signals. 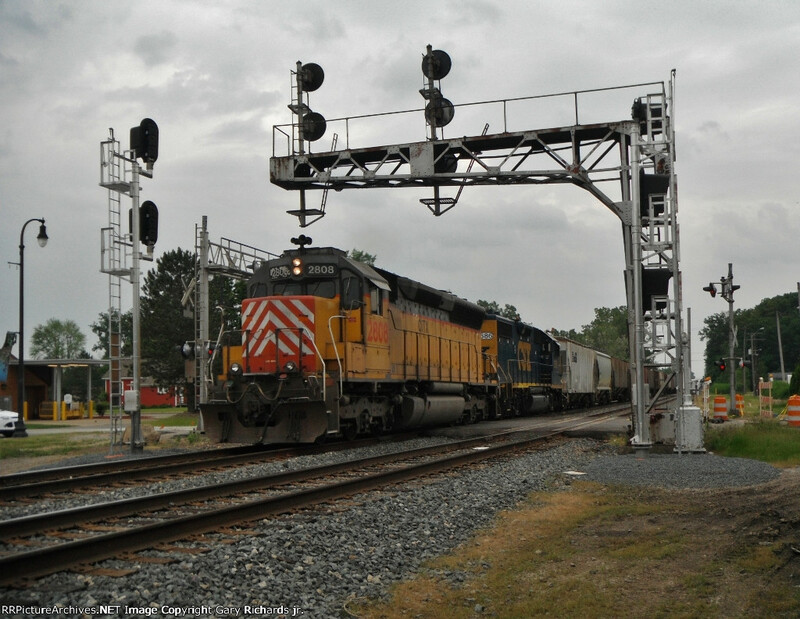 One reason the PRR not have "combination" indications such as Medium Approach Medium was that they made an effort to not to have single block signaled sidings. 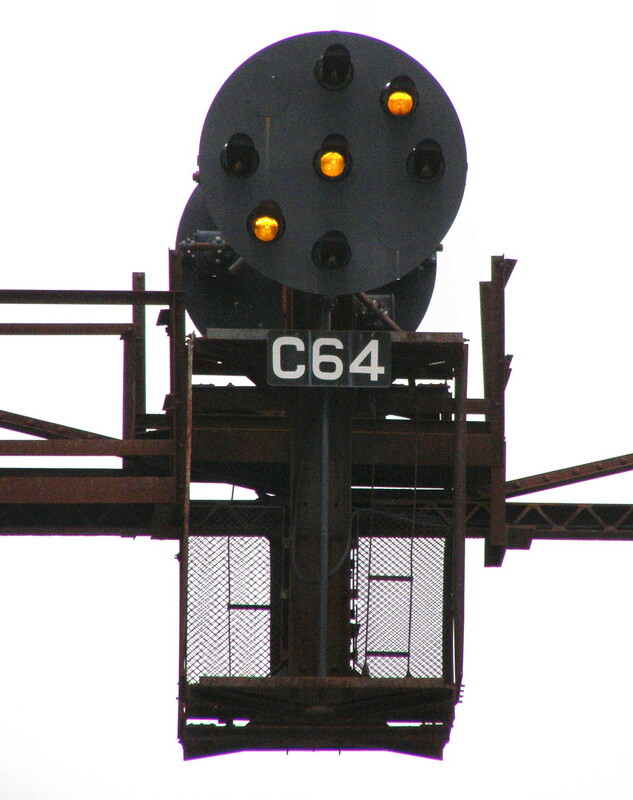 The C6x signals are located midway along a 3-mile sidings creating two shorter than normal signal blocks. 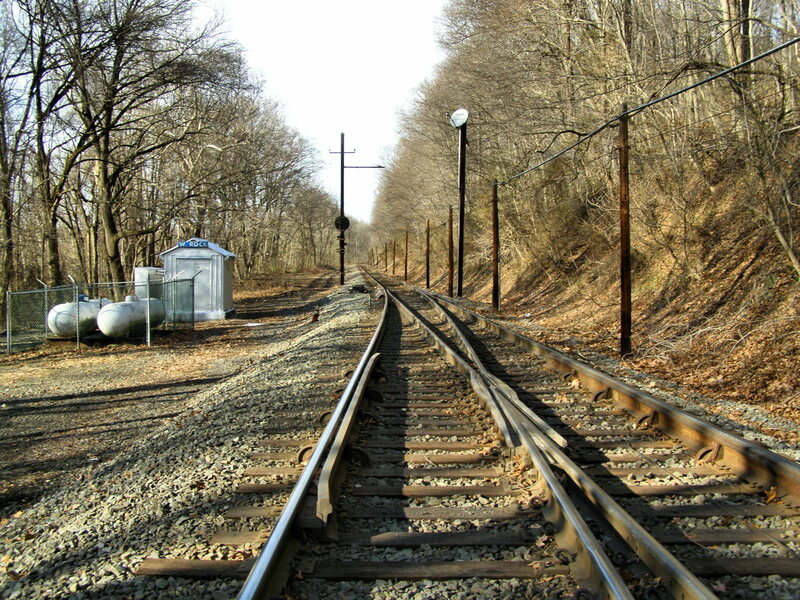 Today a modern railroad would have most likely made the siding a single block. 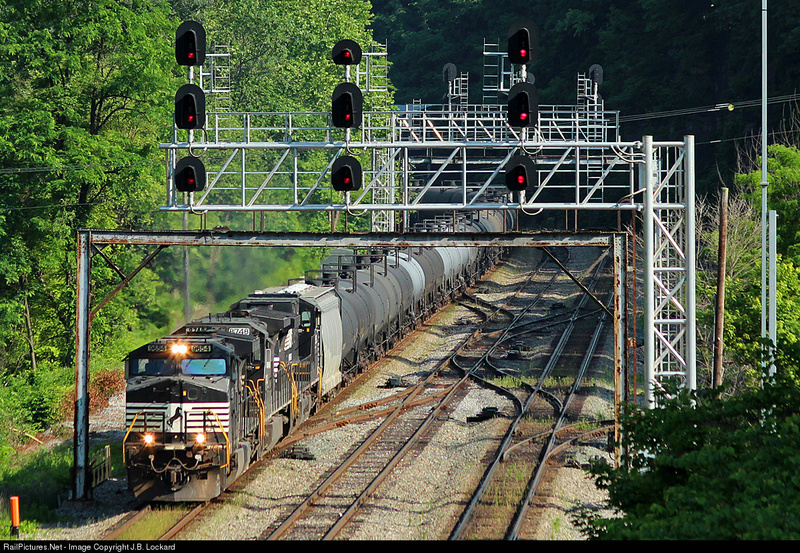 Note the end of a empty autorack train heading westbound on the siding track after delivering its cargo to the Port of Baltimore. The photo was taken early on a Saturday morning as the last of the freight traffic was being hustled off the NEC.